To celebrate Disabled Access Day, Liberty Bollen, Head of Marketing at Abode Impact, discusses the importance of recognising the needs of people with disabilities in housing. The 5th annual Disabled Access Day takes place on Saturday 16 March 2019. This award-winning movement was set up by Paul Ralph to celebrate good disabled access across the UK, and to create opportunities for people launching innovative products and services within this space. At Abode Impact, we are working on our own innovative disabled access venture to provide much-needed wheelchair accessible homes for private rent in London. Later this year, Abode will launch the first property fund dedicated to using large-scale private investment to purchase new-build wheelchair accessible apartments in London. As part of the 2015 London Plan, all new-build residential developments with over 10 units have to design 10% as wheelchair accessible, or easily adaptable, for wheelchair user residents. This is a great start. However, developers are often unsure as to how to market these types of homes. More often than not, these accessible properties end up being lived in by non-disabled people, who benefit from a larger space. For too long, people with disabilities have been underserved in the private housing market. Commonweal Housing funded Abode’s important research of 448 wheelchair user households into their housing characteristics and needs. Over 90% of respondents stated that they had experienced barriers to accessing the Private Rented Sector. 90% of the UK population will search for their next home online. 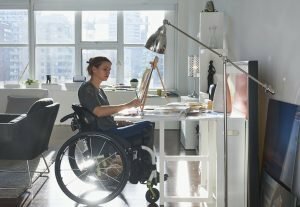 There is a plethora of online property agents to meet this demand – but they are failing to cater for the disabled people looking to rent, or buy, an accessible home. Abode Impact wants to bring accessible properties closer to the people who need them, in the same way as 90% of us will find a home. Scope’s Disability Perception Gap research shows that there are still negative perceptions of disabled people in all aspects of their daily lives, including housing, care and productivity. This is despite 39% (700,000) of UK households with an identified accessible housing need sitting in the top half of the populations’ income distribution. The term ‘purple pound’ refers to the collective spending power of disabled people and their families – worth nearly £249 billion to the UK economy. 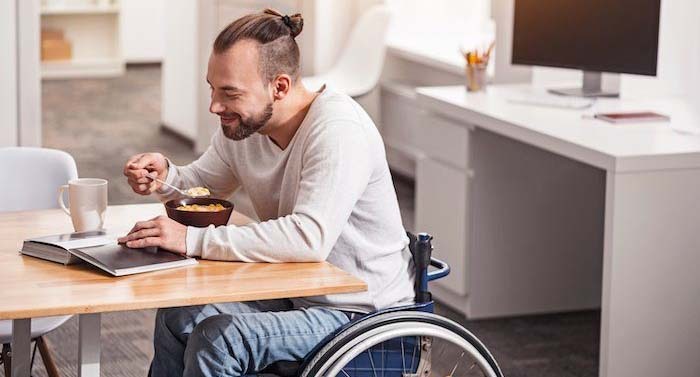 Businesses are starting to wake up to this, such as Barclays the headline sponsors of Disabled Access Day, who are leading the way to create a more accessible and inclusive banking experience for its customers. Disabled Access Day is powered by the charity Euan’s Guide, set up by Euan MacDonald (MBE) and his sister Kiki. Euan was diagnosed with Motor Neurone Disease, so his access requirements changed when he became a powerchair user. As a keen traveller, he went in search of accessible places to visit, but there was no platform to find out where he could go. Euan’s Guide was therefore born! He now has thousands of disabled access reviews and listings for places to visit over the UK and beyond. Positive reviews will inevitably reap rewards for those listed. Accomable was set up by wheelchair users Srin Madipalli and Martyn Sibley to offer an Airbnb style platform for accessible travel bookings. AirBnB itself recognised that their “guests weren’t getting the information they needed to find the right homes, nor the confidence that the home they selected would actually be accessible for them.” They solved this problem by acquiring Accomable to open up to this new and growing market. It was a very strategic business play on their part that in turn is creating a better accessible travel experience for disabled guests. The property market could learn a lot from AirBnB, so let us help them to wake up to the Purple Pound to create greater access and choice for people with disabilities. Happy Disabled Access Day all! Abode Impact is tackling private housing inequality in the UK with impact investment. Abode will launch the first fund dedicated to purchasing wheelchair accessible apartments for private rent in London. Apartments will become available in Winter 2019/20. By providing these homes, we can enable greater independence and choice for disabled people and their families. Looking for an accessible apartment to rent in London?